It's Prime Time In Your Restaurant! Rezku Prime delivers unlimited fee-free online reservations and in house bookings. In just 15 minutes you’ll see everything Rezku Prime for restaurant table management and reservations can do. Your personal restaurant management technology expert will walk you through exactly how Restaurateurs like you have taken control of service and increased seatings with unlimited, fee-free online and in-house reservations. Get the complete restaurant table management and reservations system for full-service restaurants. Maintain your high standards of quality guest service even when you’re slammed. Featuring a beautiful 19-inch large touchscreen all in one tablet, you have a complete view of front of house. Table status, servers, guests, waitlists and reservations. Break away from memorization, pencil and paper and luck. Manage the whole dining room from one screen! Create a truly special service with custom chits including guest’s name, seating, notes, anniversary, allergies and more. Now your servers greet guests by name and provide personalized recommendations for a personal touch that is unmatched. 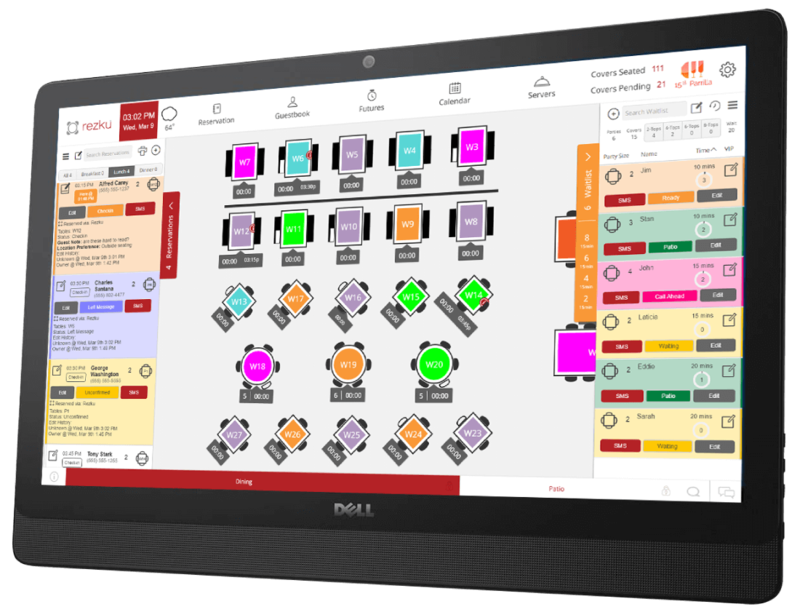 Book your free 15 minute consultation and learn how a state of the art table management and reservations system for restaurants will help you get more out of service and bring a smile to your guests' faces. Call now — 844.697.3958 — We pick up the phone! Fill Up Your Dining Room Every Night! With Rezku Prime, you have total control of online reservations. You choose the tables, times and availability. New reservations and cancellations update on the system automatically — so you’re never caught off guard. Set custom event floor plans and holiday hours in advance so reservation and table availability is always accurate! Take online reservations and book more covers! Get online reservations right on your Facebook page — without fees! Rezku Prime is more than a reservation platform, it’s a service guarantee that we will back you up the whole way through. This is our promise to you. The reward for the reputation we’ve built is our growing network of successful, fast paced, high volume restaurant partners who trust us to get the job done.